FIVE DAYS LEFT TO ENTER!! Okay fellow Artists, Musicians, and Electic Mix of Creatives, the final day for entering your work is this Friday, May 4th, by Midnight!! We have some really gorgeous work coming in from in and out of the country. We also have some very special guests gracing the "Field Projects" space with some incredible murals.We'll keep you in suspense on that for another day or two:). 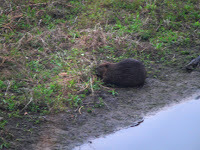 Our resident beaver came for his routine evening visit during class this past Thursday. He (or she, I have no idea which gender of beaver we are looking at here), usually snacks outside the studio window at dusk. 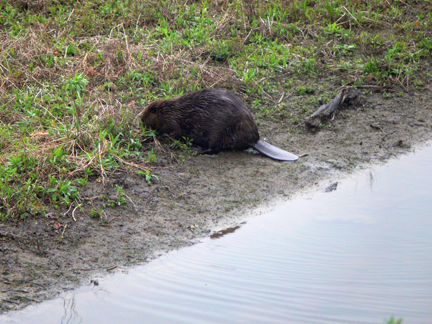 Sometime this summer photographer Mike Amodeo from Flanders Nature Center will be giving a workshop/presentation on photographing wildlife and Photoshop techniques at Blue Horse Arts. I'm definitely getting in line for that one. You can see some of Mike's work here! 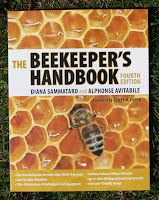 Al Avitabile Beekeeping Workshop Part 1 Video is Up! The first Beekeeping Workshop for the Flanders Beekeeping Co-op was held last Saturday.There was soooo much information to take in that we thought we would post videos of the workshop for our fellow co-opers and the public at large. 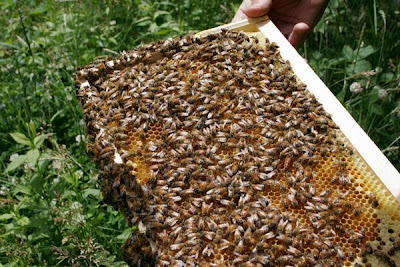 Jay Foster bravely filmed the swarms of bees excitedly being introduced to their Queen and capturing the ancedotel musings of our infamous guru, Al Avitabile. Thank you Mr. Avitabile, and Dianne Parmalee for initiating the event! The full length video is below. It is also broken up into 3 segments for easier access to pertinent information. 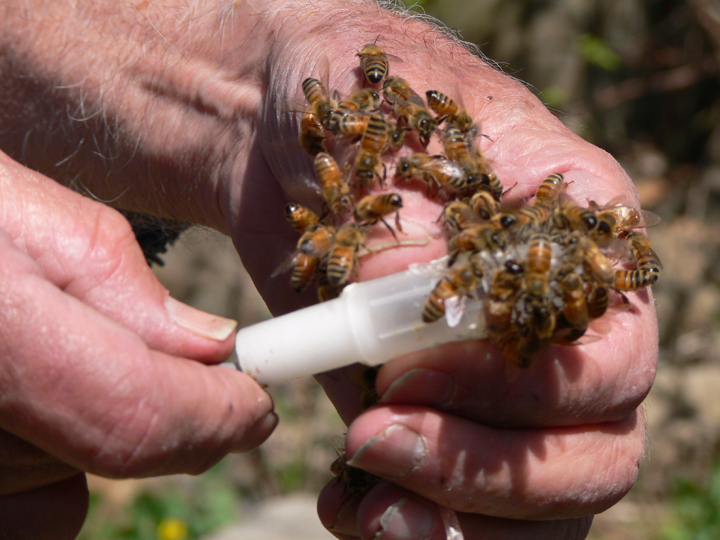 Queen of the Sun – What are the Bees Telling Us? Of this beautiful, moving, and important film the Seattle Times writes: “…Taggart Siegel circled the globe to interview the world’s most passionate beekeepers, and their testimonials make this an irresistible romance about the essential role that honeybees play in maintaining earth’s fragile ecosystem…a cautionary tale with a hopeful outlook.” Al Avitabile, Emeritus Professor at the Biology Dept. of UCONN, and co-author of “The Beekeeper’s Handbook” will introduce the film, and will be available after the film for a book signing, and to answer questions. I couldn't resist showing one of the artists who is entering. 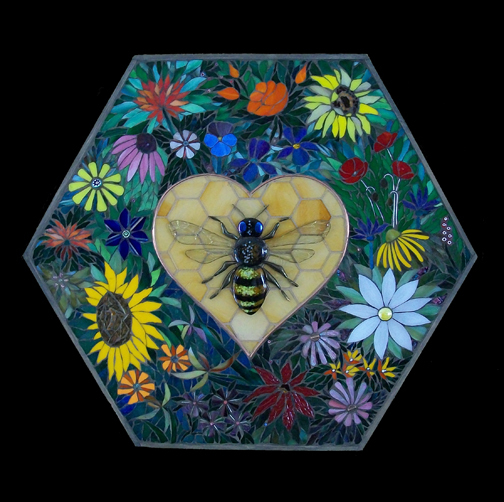 Heidrun Morgan's exquisite fused glass mosaic will be on view at the Plight of the Pollinators show on June 2nd, 2012. Heiu is family so she can't participate in the awards, but the "Field Projects"exhibition space has expanded to about 4000 square feet! so I think we can squeeze her in. The new gallery space is shaping up and will be ready for show time! Thank you Steve! Speaking of awards,check out our Sponsors and Awards page.THANK YOU SPONSORS!!!! and once again BTS Graphics for the beautiful postcards! More to come! We've had some great entries so far from around the country.Work spanning from performance and installation, to sculpture, photography,mixed media, and painting. Keep them coming!! The call closes May 4th at midnight. 15 days left!!!!! !The Pollinators Need Your Creative Assistance! Today was a privilege. 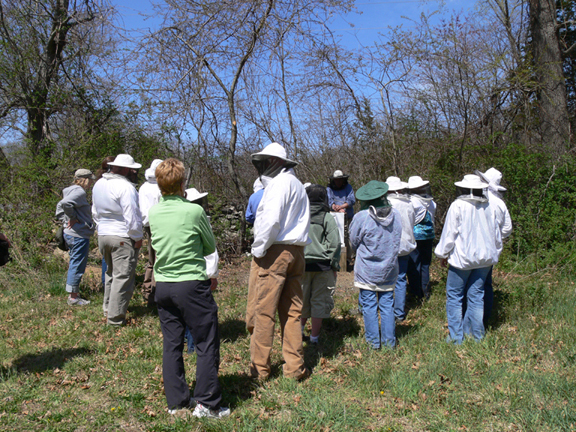 A good-natured group of bee-keeping "newbees" gathered at Flanders to be instructed by the eminent bee keeper Al Avitable. 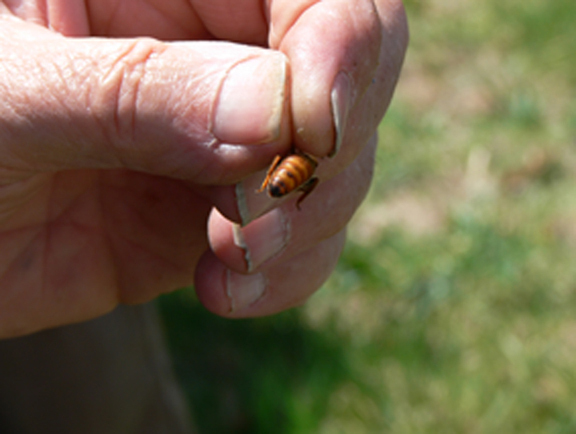 Mr. Avitabile was a most generous and entertaining guide for a journey with would-be apiarians. There was a lot of information to digest just in the unpacking of the bees, which is obviously a critical step in the success of the hive. Many preparations are needed in order for the process to run smoothly, making this workshop an important step into this endeavour. Mr. Avitabile with his anecdotal blend of scientific knowledge and calm demeanor, made it look simple. Apparently the honey bee is of Italian descent and if one listens closely to the hive the faint refrains of a Neopolitan folk song can be heard. I didn't get that close:). Close enough though! I won't give you a verbal blow by blow of the whole workshop.We'll save that for the video which should be up in a short time. For now here are some photos of the day. This book by Al Avitabile is now in it's forth edition.It is printed in several languages.Arabic being the next language to be translated. I'll be posting information on how you can obtain this tome in the near future! Thanks! Mr.Avitabile for a Great Day! Just a reminder! The first workshop of the Bee Keeping Co-op is happening today. 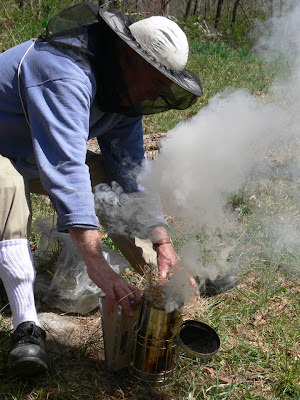 Al Avitable will be demonstrating at 12:30, how to hive your packaged bees. This event will be held at the " Pole Barn" at Flanders Nature Center and Land Trust on Flanders Road, in Woodbury, CT.
Also being held at Flanders this month is a lecture presentation by Connecticut Natural Science Illustrator, Dorie Petrochko. Ms. Petrochko also teaches workshops at Yale Peobody Museum's West Campus. 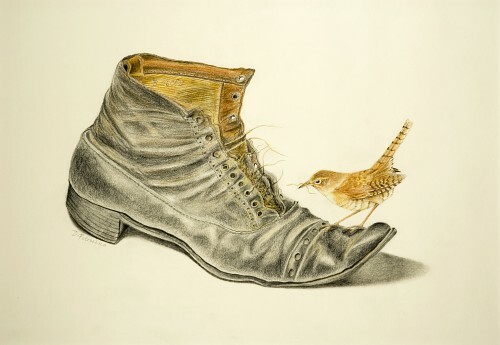 In this slide-lecture Dorie Petrochko will talk about the early influences on her bird watching as a young adult, her scientific heritage, and her explorations as an adult bird enthusiast and bird painter. 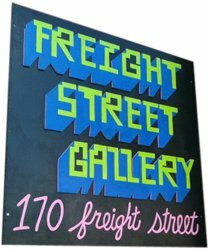 Hip-Hop and Women's Work at Freight Street Gallery! 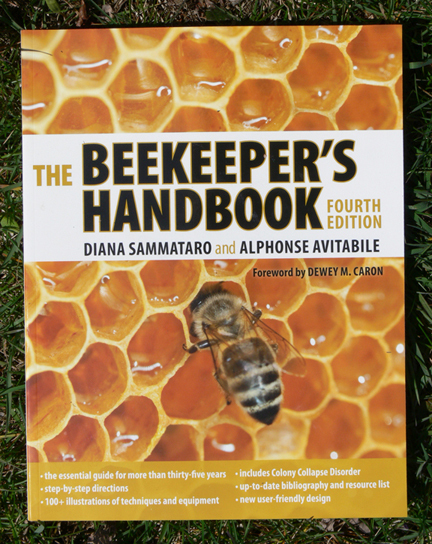 There are some other cool things to check out this weekend before you all Swarm Flanders for Al Avitable's Bee Basics Course on Saturday. 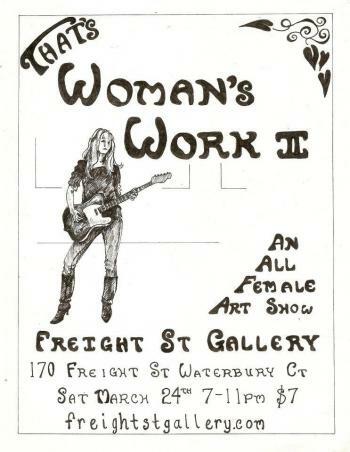 Our friends at the Freight Street Gallery still have the That's Woman's Work II Show up. Lost of interesting pieces from local artists of the female persuasion.Thank you Kerry for the invite!Tomorrow night, Friday, is a great excuse to stop in and check it out along with a bit of Hip Hop groove for you listening or hopping pleasure:). Here is the info from their Facebook page. An evening of incredible hip-hop! 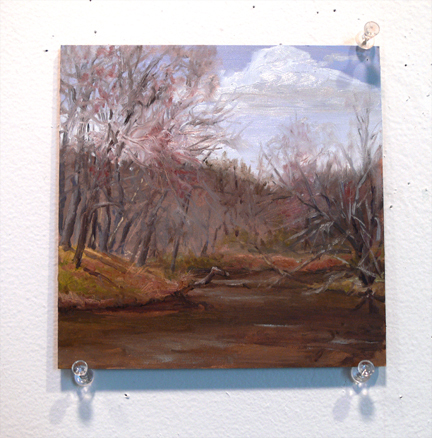 Stop by the gallery and check out the 38 artists from across CT that are currently displaying there work. Viewing hours are updated regularly. 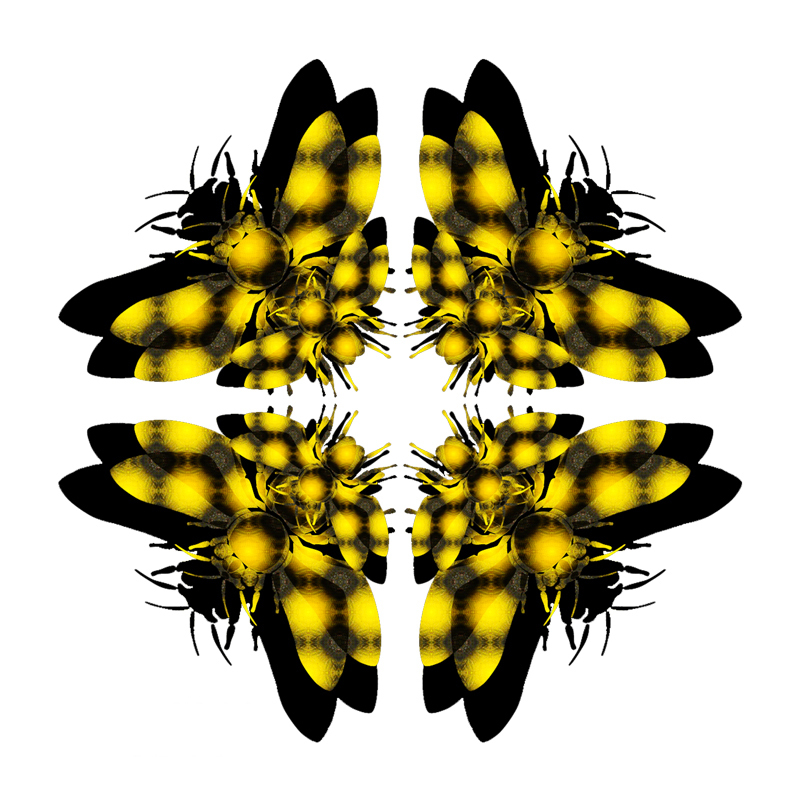 We are into Cross-Pollination :)! Plight of the Pollinators:A Call to Artists !!! Submit Art,Music,or Interpretive Bee Dancing! A page from a sketchbook I started in Singapore about a year and a half ago, random musing on the effects of genetically modified pollen. Funny where these things can lead:). Lots of cool stuff coming up with Flanders Nature Center and Land Trust. The Bee Hive Co-op training will start this coming Saturday, April 14th. 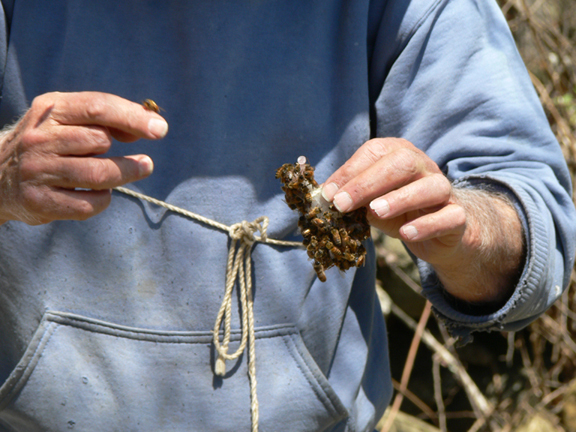 Eminent Bee Man Al Avitable will be place the bees in the hive!!! Come Watch!or BEE-Come a co-op member! 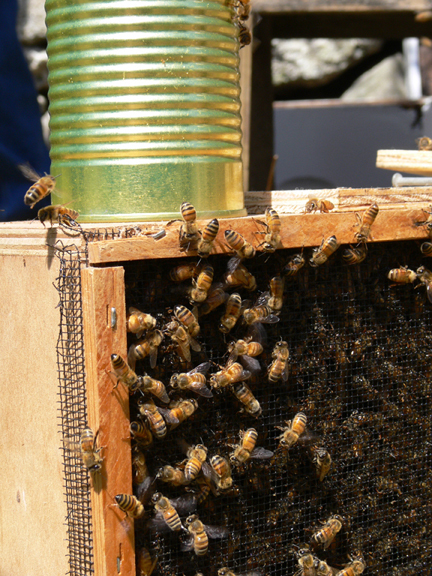 Learn the basics of backyard beekeeping. 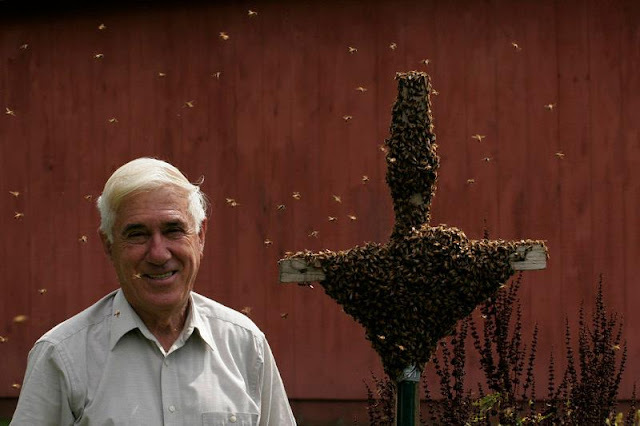 Al Avitable, Emeritus Professor at the Biology Department of UCONN and co-author of “the Beekeeper’s Handbook,” will teach you the fascinating art of beekeeping. 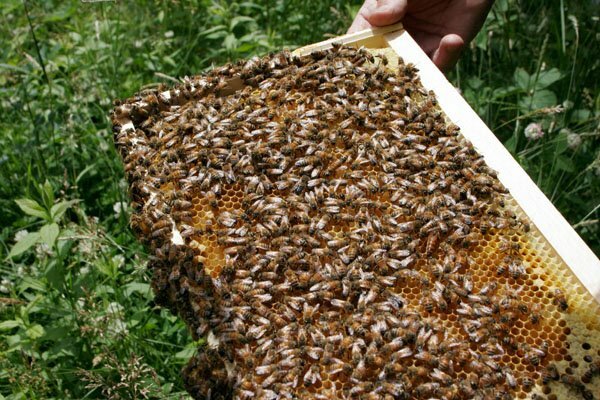 You’ll learn how to order bees and the equipment necessary to care for them, how colonies are developed, pest and diseases issues and how to extract the honey. Anyone interested in bees is welcome to attend. Date/Time: Check back later for date and time. Also the Queen of the Sun screening will be coming up soon! Participate the deadline is coming up soon! Plight of the Pollinators REMINDER!!!!! 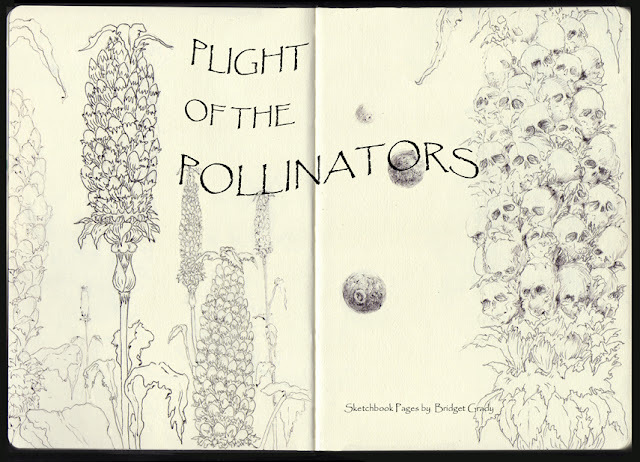 Just a reminder folks that the deadline for artists to enter the "Plight of the Pollinators" is less than a month away! Our Awards fund is growing thanks to our incredible sponsors!!!! More on this soon! 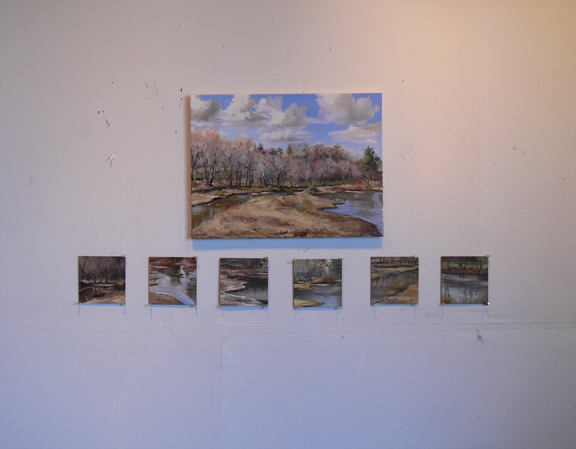 Some studies on the wall from February to April Fool's Day,executed from the studio window.Most of the pieces are 6" x 6" oil on panel.The larger piece( 18" x 24",oil on canvas) one was done over a period of 4 sunny days during the last two weeks in March. Some of these, along with other works, will be on view at the offices of Commissioner Daniel Esty at the Department of Energy and Environmental Protection. I'll be sharing the exhibition with my good friend and fellow artist, Dianne Parmalee, along with Randy Orzano this coming June. 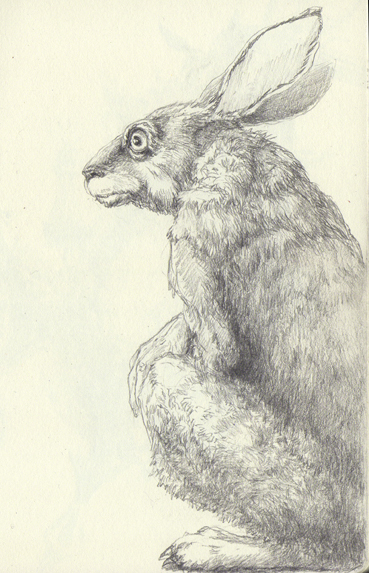 I just had the honor of being nominated the conservation artist of the month by Artists for Conservation. 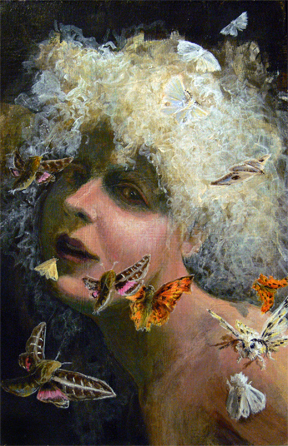 Artists for Conservation is an excellent organization that supports the conservation effort by providing a platform for artists to both express themselves aesthetically, and be able to financially contribute to the organizations they wish to support. This is accomplished by the artist contributing a percentage of the sales of their work to an charitable organization of their choice. 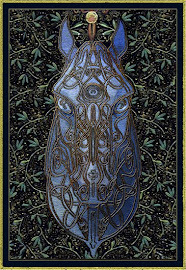 Talented artists, both prominent and as of yet, undiscovered, participate as members through out the world. I am honored to be in their company and hope to eventually be able to contribute as much. THANK YOU! 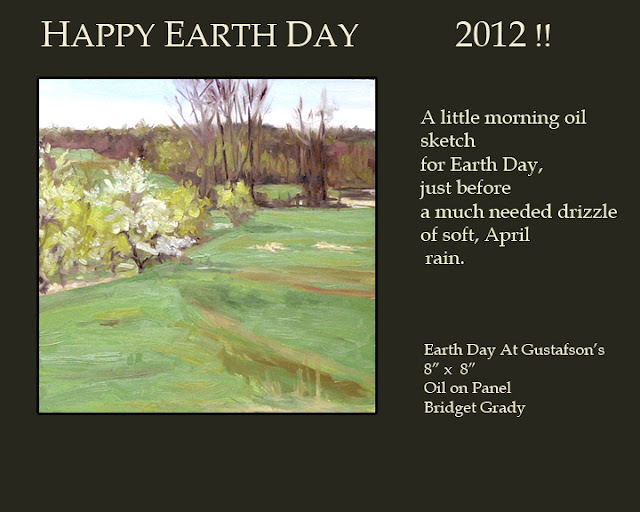 Jeffrey Whiting, (Founder & President), and the Team at Artists for Conservation for considering me for this award!!! At AFC, our mission is to support wildlife and habitat conservation, biodiversity, sustainability, and environmental education through art that celebrates our natural heritage. Through international art exhibits, collaborative art-science expeditions, publications and cutting-edge online initiatives, we engage, inspire and inform the public, and empower passionate professional artists as effective ambassadors for the environment. 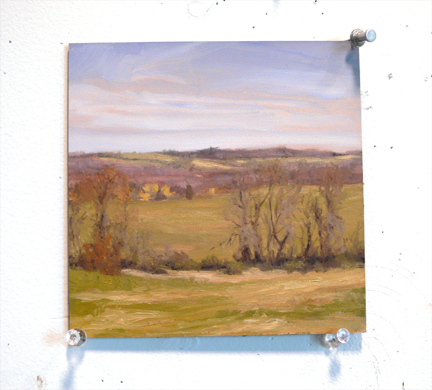 Artists for Conservation provides artist members with excellent exposure and opportunities for exhibition. Their Flag Expedition grant program promotes awareness to critical environmental issues in ecologically fragile areas throughout the world.It is a collaboration of field science and artistic research. It is a prestigious award for an artist to be considered for this fellowship opportunity. 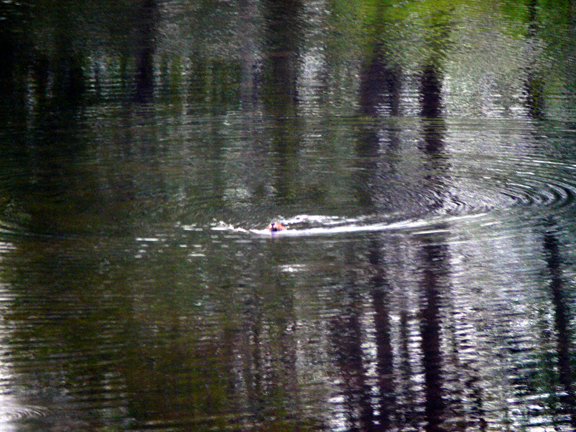 For more information on the Flag Expeditions click here. There are several ways to become involved with this organization either by becoming an artist member, a sponsor, or a donor. Please click here for more information. AND YOU KNOW I LOVE THIS LOGO ( POLLINATOR!!!:)! Click here to read the story behind their logo.